Margaret Emerson died last week. I’ve been blessed with many friends over my lifetime and loved them all, but few have changed my life. It was she who showed me, a girl born in New York City to generations of city people, how to enjoy the mountains I’d come to love. It was she who encouraged me, a clumsy child laughed at for trying anything athletic, that I could what I wanted to if I was willing to practice and persevere. It was she who taught me to ski, thus giving me one of the great gifts of my life. I met her a few weeks after we moved here in 1978. We had moved here to be in the mountains, though I had little real experience beyond camping with my family. Hiking with other women sounded exciting. Why not? I had no idea what was going to happen to my life when I turned up that first Tuesday morning, with my backpack containing lunch, water and a raincoat, as instructed, wearing a little-used pair of hiking boots my husband had given me years before. When Margaret walked in, I sensed right away that here was the group leader. She was the founder of BWAGs, though I didn’t know it then, someone who had brought the concept back from New Zealand and started it here, all by herself, finding places to do things, pounding on church doors to get a nursery for baby-sitting in the days when everyone had young children, sweet talking Bridger Bowl into cut-rate Ladies Thursdays. “I thought you had jury duty,” someone said. What was I getting into? I soon found out. We went up Line Creek—and “up” was the operative word. I learned you climbed until your legs ached and you grew out of breath…but you kept going and didn’t complain. I learned you told stories and laughed at life and shared confidences, as women will. And most of all, I learned how sweet and beautiful was the top of a mountain when you fought your way up there. I found out what Margaret meant. I was hooked. And I rarely missed a Tuesday after that—for 37 years. But hiking was one thing, skiing another. It took me five more years to overcome my fear of falling, my memory of the mocking laughter of classmates in a thousand gym classes. But thanks to Margaret and her “BWAG drag” technique, I discovered I could control my speed down those hills I feared so much and…skiing hills was fun! I found out it was, indeed, easier to glide somewhere on a pair of waxed boards than to put one plodding foot ahead of another. After that, winter became not something to be dreaded or endured, but welcomed. I cheered when the snow fell. 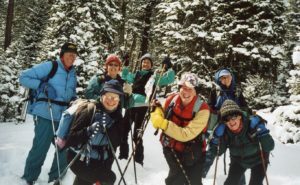 About ten years later, a small group of us dropped out of BWAGs so we could include Margaret’s husband, Ken, and skied together for almost twenty winters—not only on Tuesdays, but on Thursdays and Saturdays. How much fun we had exploring Margaret’s favorite roads, trails and secret places. I keep that picture on the bulletin board behind my computer to remind me of those good, good times. For the group is gone now. Several of us have died; the rest are too old and fragile to ski as we used to. But I’ll cherish those memories as long as I can put two thoughts together. What I’d have missed had I not showed up in that church parking lot on that first Tuesday morning! And how much I owe that strong, creative woman who fought so hard to make it all happen. Thank you, Margaret. I owe you more than I can say. And keep your skis ready. I’ll see you on the other side.